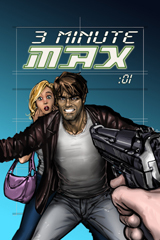 A few weeks back, as I was away in Ireland, my Dad published the initial pages of our webcomic, Three Minute Max, which is updated like clockwork every Tuesday and Thurday at 12 AM, EST. If you haven’t already seen it, please check it out, as I consider it some of my best work. Superhero/Sci-Fi with some supernatural goodness. It’s pretty violent, but basically on par with most superhero comic books. My father and I invested a lot of our time and money into this longshot project, and are self-publishing on basically no budget, so if you like it, go one step futher and “like” it on facebook, and maybe even share it or recommend it to friends. It’s much appreciated. So some more background on the project… Three Minute Max was, according to my recollection, something that was sparked at one of our regular Sunday Morning Breakfasts, which my father and I try to do on a weekly basis, for almost 10 years now. We usually end up discussing how much the world has changed since the week previous. And in this case, must have been 2007 or maybe even 2006, we were talking about online web series, and how cool it would be to do one. We had just finished Kabumei, on the heels of Return of Agent 12 (starring my younger brother, John), and were considering pushing forward with that momentum into another action project, possibly starring myself. A few ideas gained traction, and are still in the pipeline, but they were more epic in scale, and we agreed that something more manageable, an online short web series, was something maybe more appropriate for our next project. And anyway, this was before all the modern compression codecs for streaming video- at this time in technology, people were thinking the industry would move to short form web project- like what you would see on funny or die, for example. This was before Hulu changed that. But we were in the short form mindset. I agreed- and not just because my name happens to be Max- that was quite literally just a weird coincidence. Story could be something about a mercenary who gets teleported into a hostage scene or something, kills all the bad guys with his bare hands, and teleports out in under three minutes. Sounded awesome. And then we never discussed it further, until at least a year later, when I was feeling like I could possibly divide my time between my (at the time) fledgling career in commercial storyboarding, and a comic book project. I have always wanted to do a comic book, of course, and I was gonna make it happen. I emailed my dad one night and asked him if he would mind if I took that Three Minute Max concept and made a comic project out of it. The next morning he emailed back the script for episode one. It was great but very different from what I had envisioned, and I had reservations. I voiced my concerns, and he responded with the script for episode two. Seeing that, and where he wanted to go with it, I could see the real potential for really innovative comic action, and I was on board 100%. The only problem was that at that exact moment, my career started taking off, and I didn’t have all the downtime necessary to turn the pages around in a timely manner. I had pretty exacting standards for my own personal artwork, a debut comic book project, and so the comic need to be something I could be proud of. So this three month project took about about 5 years to finish. I finished it the day before I left for my vacation to Ireland last month. And now its out there, slowly unveiling, for all the world to see and judge, and I’m scared shitless. Just kidding. Well, not really. I do have anxiety about whether the project will be “successful,” but I’m proud of my efforts, and really, even if nothing else ever comes of it, the fact that I was able to collaborate with my Dad on such a cool project makes it all worthwhile.